A site inspection was performed. It was determined that the stairway was in a state of disrepair: grossly unclean and poorly lit. 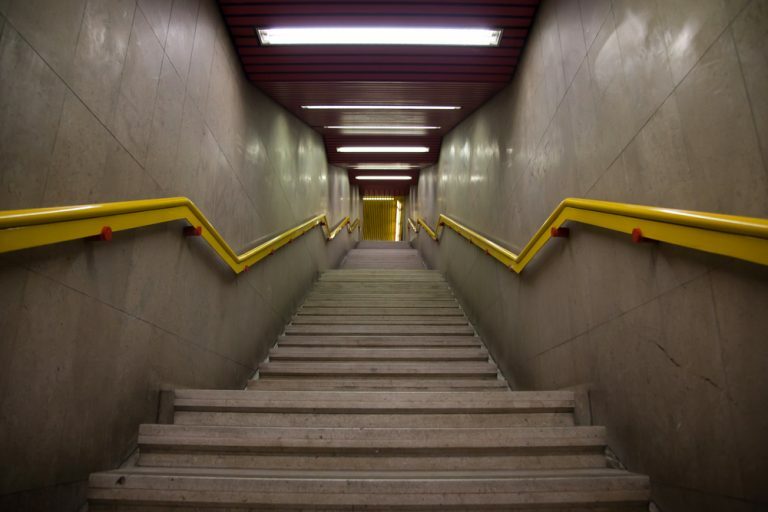 The stairs received an overhaul only once in its 85 years of service – in 2007. The defendant’s engineer argued that the stairs were “grandfathered” from compliance with present day building codes, as the stairs’ original construction preceded the code adoption. This erroneous position ignored that when a major overhaul is conducted, the new work, as a minimum, must be in compliance with all codes in effect, at that time whenever possible. Defendant’s engineer furnished a few of the stair renovation drawings and they revealed that all new stair treads, handrails, and painting were to be performed during the renovation. Even if a particular condition was to be considered “grandfathered,” any dangerous or unsafe conditions must be abated whenever major repair or renovation work is performed on and/or around it. A grandfathered condition is not necessarily a “safe” condition. The grandfather exemption did not make the non-code compliant conditions “non-hazardous” by the fact that they may have been grandfathered. A review of the 2007 renovation drawings also revealed that the completed work was not performed in compliance with the contract drawings. Critical stair riser heights and nosing positions were not in compliance with the drawings (which oddly enough did comply with present building codes). The renovation drawings called for the installation of ceramic tiles on the stair treads. Instead of ceramic tiles, the stair treads were overlaid with thicker precast concrete units. This increased the riser heights of those treads – but not the top risers of each flight, as the landings were not overlaid. Because of this, the allowable variation of riser heights per flight did not comply with the building code. The concrete tread material was too soft for use in such a heavily travelled placement, and they quickly wore in an uneven manner making them hazardous to pedestrians. Tread nosings were also of this material, and they rounded over due to foot-traffic, causing them to become hazardous as well. Result: The plaintiff accepted a generous settlement offer from the defendant. Bryan J. Smith, PE, Construction Site Safety/Slip & Fall/OSHA Consultant with DJS Associates, can be reached via email at experts@forensicDJS.com or via phone at 215-659-2010.